Currently, I’m gravitating towards floral prints, especially in dresses. I love the ladylike feel of the print and it’s totally appropriate for the new season. In my book, a floral print dress is an absolute must for spring! It can easily be dressed up with classic pearls and heels (perfect for Easter Sunday) or even dressed down with a pair of casual sandals and a denim jacket. How are you wearing florals this season? You look beautiful! Who takes your pictures? You look marvelous. Love that cute floral dress. Lovely look! Super jealous of the warm weather it looks like you’re having in this picture! So ready for Spring weather! That Tory Burch dress is SO pretty on you! I love the neutral floral print of that dress & the pop your clutch brings to the look! So feminine and fun! The dress is really beautiful :) and the necklace too. This dress and look is beautiful and chic for spring. Yes! Adorable dress <3 So jealous of your weather! This dress is gorgeous on you and perfect for the spring! That dress is darling! Love those pearls, girly! So ladylike and elegant. I love how you dressed it up with pearls and that fun YSL clutch! I love this dress. The colors are so pretty and florals rock! Oh I love this dress! Perfect floral look! lovely outfit! so beautiful and ladylike! I especially love the sunglasses! I absolutely love that dress! The pearls with it are perfection! Gosh this is absolutely lovely. I’m also a huge fan of florals! So pretty! I’m not usually one to wear florals but I really feeling them this spring. Will definitely buy few pieces. Love the dress! Perfect for Spring. This clutch is everything. So pretty! This is so, so beautiful. Great colors on you! Gorgeous floral dress. Perfect for Spring. This took is perfectly ladylike from head to toe. The pearls with this pretty floral. And a pink clutch. A woman’s dream look!! So beautiful!!! This is such a great outfit on you! I love that dress and that necklace is stunning! Super cute dress, and loving the pearls! I love a casual top with jeans to keep things simple. this dress is beautiful, the length is perfect. This floral dress is perfection! So pretty Rach!! I really love this dress on you..
What a lovely dress. And i love the bright clutch too. What a lovely & feminine outfit! Lady like perfection! Love the dress and the clutch adds the perfect pop of color. Love the florals going on! So perfect for Spring! You look gorgeous. You make so excited for some spring weather to show up here! I want to get my dresses out again! How do you look after your Louboutins? I am so scared to wear mine out in case I ruin them! I love this floral pattern! And the whole outfit is just expresses spring and class! The necklace and the shoes add the perfect understated polishing touches! The floral print of this dress is so stunning! Rach that dress is stunning on you! Looking fab have a great week! I love this dress especially for Easter Sunday! Gorgeous! I love the ladylike look. Beautiful dress! Loving florals for spring! I follow back other fashion blogs as well and would love if you checked mine out! I am in love with this look! From the adorable glasses to the incredible dress! You are perfecting this look girl! This dress is absolute perfection on you! I love this little Tory Burch shift and that print is gorgeous. Love how you styled it Rach! Niceeee! The dress is amazing and looks very good on you! Seriously LOVE this look. I’m obsessed with Tory’s Spring collection. I also have a lot of floral looks coming soon. I absolutely agree with you! Floral dresses are a must for spring! Fresh, green, pink – BEAUTIFUL! Beautiful spring outfit head to toe!!! You look fabulous! What a great Floral piece. You look so pretty in it. Great look. This is the perfect Easter look! The layered pearls make is so sophisticated. I want Spring to be here so bad in Chicago! That dress is to die for. I love how you styled it with the bright pink clutch. So perfect! This dress is fabulous!! You are stunning, Rach! I love that you added pearls to make it even more classy! I loved how you said that you could wear this dress with a denim jacket & casual sandals. The shape & length of the dress makes it so versatile. What a great addition to your spring wardrobe! This dress is super cute and your accessories are perfect! This dress is perfect for bridal showers or spring tea parties-love it. I just love this outfit! The pearls, the floral dress, the Louboutins, everything is just gorgeous. Latest Giveaway: $400 Anniversary Giveaway! Love the floral dress! Great for Easter and Spring! So pretty! Perfect dress for spring! LOVE this look. The dress is beautiful but the details you added with your jewelry especially make it look so classy and elegant! I’m seriously obsessed with this dress! Love the print and fit! I love the dress! I just did a post on sales and found great florals for under $30! Such a great look in florals!! Like the floral look but I love your accessories! Great choice in the pink YSL bag! Florals for spring…ground breaking. Considering your sister did a post with the same exact dress and multiple instagram shots, you would think you would at least give her a shout out. Yawn, this blog has become so boring. Love that dress! You look so pretty!! 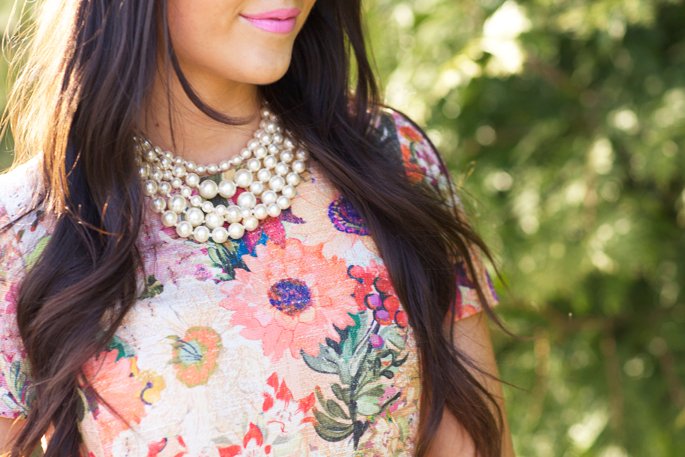 Pearls & floral look great together! I’m so ready for summer! Hey there! I know this is somewhat off-topic but I had to ask. Does running a well-established blog such as yours require a lot of work? I’m completely new to blogging but I do write in my diary every day. I’d like to start a blog so I can easily share my experience and feelings online. Please let me know if you have any suggestions or tips for new aspiring bloggers. Thankyou!